National Greyhound Adoption Program and Dutton Road Veterinary Clinic has the unusual ability to step up to the plate and go above and beyond to help those pets that are in desperate need of care without viable alternative. We received a call about two Italian greyhounds literally living on the street of New York with their owner that could not take care of them. Since we have so much experience with both greyhounds and Italian greyhounds, there was no question that we would take the dogs in and do all that we could to make them whole again. 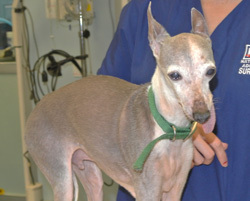 Piccolo is a 10lbs, 14-year-old, male Italian greyhound who is a little thin but not skeletal given the circumstances. When you open the mouth, there was not much to see but what was there, was not pretty. There was a fistula on the left side of the upper jaw. A fistula exists when there is an opening in the jaw going into the nasal cavity. The right side there were two to three teeth, one a canine, looking terrible. In the rear of the right, there was an upper and lower molar with three or four times the normal build up of calculus. We were able to take out the molars without disturbing the calculus so you can get some idea of what the teeth actually looked like. This was only possible because there was not much holding them in any longer. 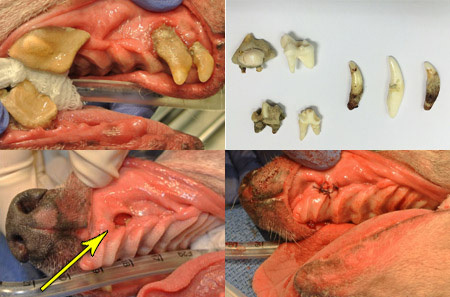 Top: The left image shows the four remaining teeth significantly covered with plaque and tartar/calculus compared to the removed teeth on the right. Bottom: Arrow points toward the fistula leading to the nasal cavity. The right picture shows the sutured hole. 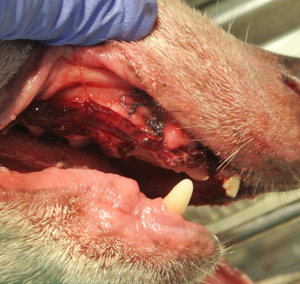 Did the owner of this dog actually have dentals and extractions done or have the teeth simply fallen out on their own? We will simply not know the answer to that question. In doing our initial exam, we felt the lower jaw had significant play so immediately after the dental was done, Piccolo went into for a x-ray of his jaw and we found that his mandible, the front part of the jaw, is fractured and unstable. Fortunately he is able to eat, and a correction would be extremely difficult and painful for his age. He came through surgery well. 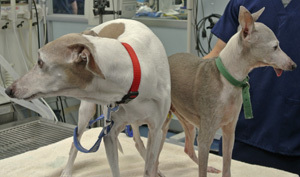 The other Italian greyhound that came with him is named Nixxi who is 7 years-old and weighs considerably more. When he went on to the operating table to have dentistry done we removed 22 of his teeth and some canines. In a few weeks they will hopefully be available for adoption together. Italian greyhounds have a mouth configuration very similar to greyhounds and maybe that's why they have similar dental issues. We know they don't eat the same high bacteria food that greyhounds eat, so it must be something in the way their mouth is configured that doesn't help with keeping their mouth healthy. If you have an Italian greyhound, pay attention.